Troyes, a city on the Seine dating back to Roman times, is full of historic buildings. Among them is the Hotel de Mauroy - SG 2273 of 1978, issued for the 51st Congress of French Philatelic Societies.A Hotel in this sense does not mean a hotel as we use the word in English - it is a grand townhouse. Strasbourg in Alsace is now the base for several international institutions, including the Council of Europe. In my thirties and forties I spent many days negotiating at meetings organised by the Council of Europe. Although now in France, historically it was long a city within the Holy Roman Empire (whose emperors were of German origin and often at war with Popes because of contests over territory in Italy). It became part of France in the 17th century. After the Franco-Prussian war of 1870, Germany annexed it: it was returned to France after World War 1, only to be annexed again by Germany during WW2. It was liberated and restored to France in 1944. 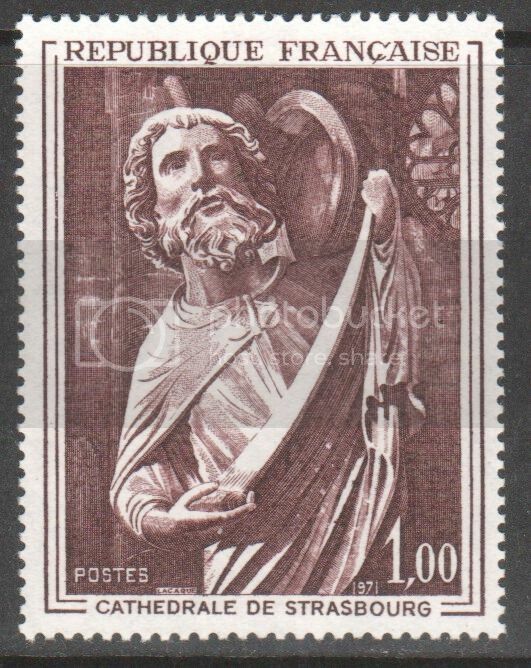 Among the many historic buildings there is the Cathedral - here is a statue of St Matthew in the Cathedral, on SG 1908 of 1971. The Meuse valley in the Ardennes region of France, 1948 SG 1069. This was the area where the Germans in 1944/5 attempted an unsuccessful counter-offensive, the Battle of the Bulge. The Meuse is about 575 miles long, and navigable for much of its length. In recent years it has been increasingly subject to flooding. The marine Mesozoic reptile Mosasaurus is named after it, the first fossils of this creature being found in 1780 outside Maastricht in Belgium. Geologists believe that the Meuse has been flowing for over 300 million years, making it probably the second oldest extant river in the world. In Eastern France, something over 25 miles NE of Lyon, is the cathedral city of Bourg-en-Bresse, whose inhabitants are known as Burgiens. 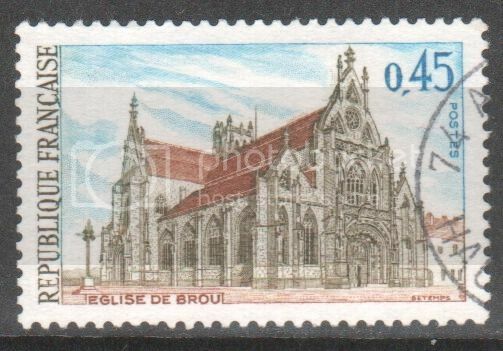 Here is the 16th-century monastery church of Brou in the city, on a French stamp of 1969, SG 1814. The church was built mainly in the Gothic style for Margaret of Austria, daughter of the Holy Roman Emperor Maximilian I.
Dijon in Burgundy has been an important city for centuries. Burgundy was long an independent state, often more powerful than France itself, and often in alliance with England against France. It lost its power in 1477, when the last Valois Duke died fighting the Swiss, and his realm was divided between France and the Habsburgs. Neither side was satisfied with the results, and disputes over lands of the former Burgundian state led to a number of major wars in subsequent centuries. The Palace of the Dukes of Burgundy dates back in part to the 14th century, though it is mostly a 17th and 18th century building. Today it serves as the Town Hall and also contains the city's Fine Arts Museum. Here it is on a 1973 stamp, SG 2006. Time to hop (with our bicycles, naturally) across part of the Mediterranean, to Corsica and its main city, Ajaccio, where Napoleon was born. For several centuries Corsica was ruled by Genoa, but it was eventually sold to France in 1768, and became formally a part of France in 1780. In 1943 there was an uprising against the occupying German forces, and Ajaccio was the first French town to be liberated. Corsica has the distinction that, despite being occupied during WW2, no Jews were deported from the island and none were executed there. 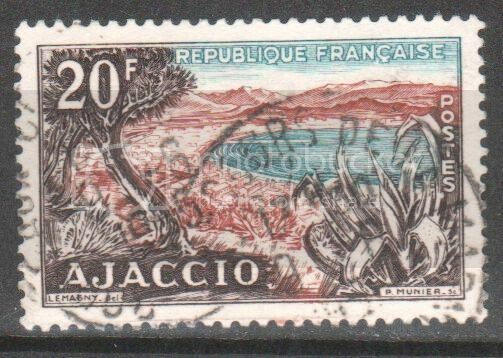 Here is Ajaccio on a 1954 stamp, SG 1211. 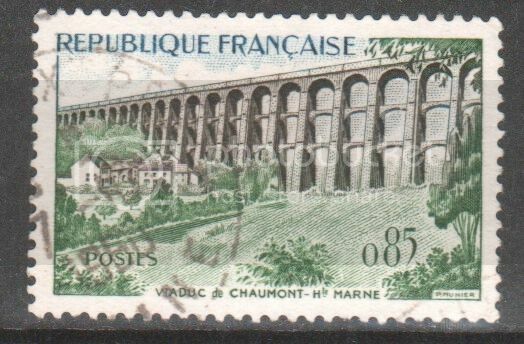 Chaumont on the River Marne in Eastern France lies on the main railway line from Paris to Basel in Switzerland, and has a spectacular railway viaduct shown on a 1960 stamp, SG 1466. The viaduct was built in 1856 and is over 150 feet high and over 600 yards long. In 1814 the town was where Great Britain, Prussia, Austria and Russia signed an alliance against Napoleon. Heavily bombed during World War 2, Chaumont was from 1951 to 1967 the site of a US air base. Caen, near the Normandy coast, was another place that suffered badly during WW2, being heavily bombarded during the 1944 Allied invasion of Normandy. 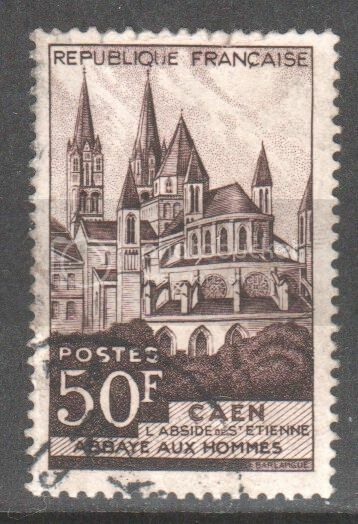 William the Conqueror was buried there, and among the religious buildings he had constructed in Normandy was St Stephen's Abbey in Caen, shown on a 1951 stamp, SG 1139. William's tomb was destroyed during the French religious wars of the 16th century, and its replacement was destroyed during the French Revolution. Today there is a just a marker slab. During the invasion of Normandy, many inhabitants of Caen took refuge in the Abbey, which served as a hospital. Dinan is a walled medieval hilltop town in Brittany shown on SG 1547 of 1961. Every other year there is a two-day festival in which people don medieval garb. The bridge there was until recently the crossing-point nearest the sea on the River Rance. Nowadays there is another crossing at a tidal power station on the Rance estuary. Still in Brittany, on the West coast, is the town of Douarnenez. Offshore, according to tradition, is the submerged town of Ys. According to legend, Dahut, daughter of the Breton king, organised orgies in the beautiful city of Ys and had her paramours killed after a night of licentiousness. During a storm either Dahut herself in drunken semi-stupor, or the Devil, opened the gate which protected the city against the sea, and it was swallowed by the waves. At low tide the island of Tristan, linked to some versions of the legend of Tristan and Isolde, is connected to the town: the island was the site of a medieval priory, and then, in the 19th century, a sardine-canning factory, but is now a nature reserve. Today, Douarnenez is the venue for a biennial international sailing festival, and has a maritime museum with fishing vessels dating back to the early 20th century. Boats from the museum are shown on SG 2834 of 1988. Lille in NE France is one of the major cities of the country. The area was originally marshy and this accounts for the city's name, which means "the island". There is a lot of industry, but the city also has many old buildings in the centre, and the biggest French art gallery outside Paris. 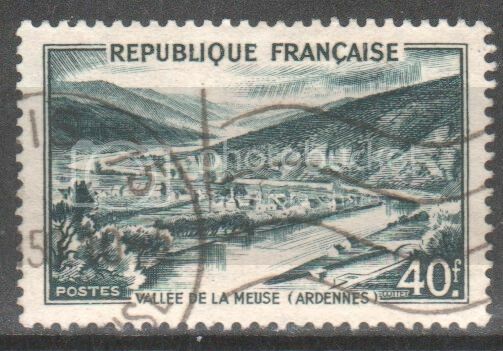 This 1945 stamp, SG 1055, shows some of the sites. Rouen, another important city in Northern France, was for long the capital of the Duchy of Normandy. Those of you who know your history will recall that this is where Joan of Arc was burnt at the stake, and there is a modern church dedicated to her. Rouen also has an important art gallery. Here is the Cathedral on a stamp of 1957, SG 1354. The impressionist artist Monet did a series of paintings of the Cathedral facade in different lights. Not too far from Rouen is the Abbey of St Wandrille, also known as Fontenelle Abbey, founded in the 7th century. The Abbey suffered a series of disasters in the centuries that followed. In 756 the church burnt down. In the mid-9th century, the Vikings raided and burnt the Abbey. The monks returned in 966 and a new church was again destroyed by lightning in 1012. In 1250 yet another replacement church burnt to the ground. The present church was completed in 1331. The Abbey was suppressed during the French Revolution, the site serving first as a factory and then a home. In 1893 monks returned, but they were expelled by the then anti-clerical French government in 1901, and did not return until 1931. From 1907 to 1914 the Belgian writer Maeterlinck rented the Abbey, living there with his lover. The church was badly damaged during WW2: a new church was consecrated in 1970. If you were superstitious, you might think the religious community was cursed, given all these setbacks - or you could see the history as a testament to human dedication and determination. Here are the cloisters on a 1949 stamp, SG 1068. Michael, thanks for the scans of many beautiful stamps and the very interesting information. Riquewihr is a village in Alsace in Eastern France. Its germanic name reminds us that Alsace became part of France only in the 17th century, and was annexed by Germany after the Franco-Prussian War of 1870-1, being returned to France only at the end of World War 1; and was again annexed by Germany during WW2. The town has medieval fortifications and many old houses, in addition to producing Riesling and other wines. Here is a street scene with the medieval gatehouse on SG 1931 of 1971. Reims Cathedral in Northern France is one of the great medieval cathedrals of Europe. It is here that French kings were crowned - you can find a full description of the elaborate ceremony at en.wikipedia.org/wiki/Coronation_of_the_French_monarch. The building is on the site of Roman baths. In 1233 there was a violent dispute between the Cathedral clergy and the townsfolk, during which several priests were killed or badly injured. From 1415 to 1429, during the latter decades of the Hundred Years' War between England and France, the English held the city - it was liberated in 1429 by Joan of Arc. The facade has more sculptures than any European cathedral apart from Chartres. The city of Reims is one of the centres of champagne production. Here is the Cathedral on SG 472 of 1930. Uzerche in central France occupies a strategic position at the intersection of two major trade routes, one from Brittany to the Mediterranean, and the other a crossing of the River Vézère, a tributary of the Dordogne. There has been a settlement there since well before the Roman conquest of Gaul - and it was the site of the final unsuccessful resistance of Gauls to Julius Caesar in 51 BC. In the 8th century the town successfully held out against a 7-year siege by islamic forces: legend has it that, when the town was on the point of total starvation, the inhabitants fattened the last two remaining cows, and sent them towards the besiegers who concluded that the place so well provisioned they did not have a chance of making it surrender, and promptly abandoned the siege. The town has many medieval fortifications and other old buildings. Here is a stamp of 1955, SG 1266. Back to NE France. Near the border between France and Belgium is Saint Amand les Eaux, whose symbol is an abbey tower some 250 feet high, featured on SG 2188 of 1977. The abbey was founded in the first half of the 7th century, but destroyed by the Normans at the end of the 9th. It was subsequently rebuilt, but several times badly damaged by either fire or warfare. Most of the abbey was demolished during the French Revolution and Napoleonic Wars, but the tower was spared, and now houses a faience museum: the town was an important centre for faience production in the 18th century.